Message in solidarity with ZAD by the Frente de Pueblos en Defensa de la Tierra, Atenco. Originally published by Centro de Medios Libres. Translated by Voices in Moverment. 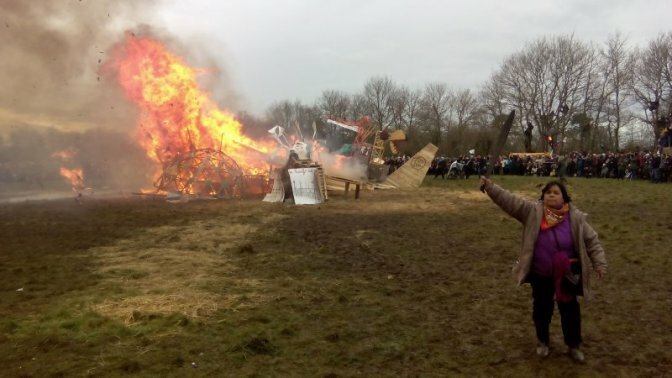 Read all our articles about ZAD here. From our small bit of homeland in Mexico, Atenco, we embrace you. A few weeks ago, our compañera Trini was able to visit your trenches and she came back full of joy for the victory that you all achieved against the airport in the forests of Nantes, France. She shared with us the accomplishment that you all have built to overthrow this megaproject. We are inspired by your morals, because to defend the earth and defend life, is a sacred act. This is particularly true in these times where the most barbarous capitalism only leaves us the options of submission or extermination. As human beings, we grew up and learned that dignity is our second name. We feel and assume the obligation to not surrender, to struggle and construct, to live and die facing the sun. In Mexico, our struggle, like that of many brothers and sisters that also struggle in the defense of the earth, forests, water and natural wealth, is no less complex. But we are very clear that we are on the correct path, as are you all today, that immediately after the victory you have achieved comes another challenge. We know in advance that no victory is ordered. No. The victory of justice versus the unjust is a construction of lessons and dignities capable of reconstituting itself after each punch, after each adversity. We owe our migrant brothers and sisters and everyone else so much. Perhaps throughout the history of humanity, they are the family most exemplary of the courage to go on loving and continue living in other countries where they continue planting seeds for the future. To all of you that resist and defend that bit of homeland, in Nantes, to all of you that opened your hearts to us, and shared with us your strength, we say to you that YOU ARE NOT ALONE. In Atenco, in each act of struggle that we carry out, we will name you, we will keep you present, we will evoke you, because the love that you defend is ours as well. As it is there where distance and language aren’t important. Love for life is our umbilical cord reminding us that we pertain to the earth and that we will not give in to the capitalist executioners. ALL OF OUR SOLIDARITY AND SUPPORT TO YOU FROM MEXICO! Frente de Pueblos en Defensa de la Tierra, Atenco, April 17, 2018.